The Everest Training Program is the marriage of science and passion. Using a variety of workouts and combining different levels of intensity and rest, has proven to bring out the best in our athletes. Our coaches are actively competing athletes. Our advisers are the leading minds in their fields. Practical application has led us to engineer a strong mind-body-performance relationship using specific benchmarks to monitor improvement. We want you training smarter, not longer; performing faster and stronger. Head coach Bill Bishop realized there was a gap between what an athlete needs to train at the highest level, and how to deliver that programming — while enabling them to navigate the commitments of their personal and professional lives. There is no technology available that gives an athlete the power to take control of their training program, tailor each individual workout to their specific ability and provide an open platform for coaches to adjust their experience on the fly. Until now. 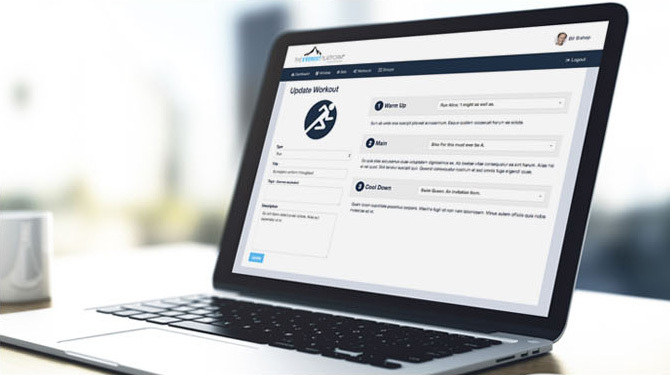 Bishop Racing Inc. has developed The Everest Platform, a proprietary coaching software that allows both coaches and athletes to be at their best, 100% of the time. From workout and program design, to distribution and feedback, The Everest Platform is truly in a class of its own. Welcome to the new wave of training technology. Guidance on daily dietary needs. It’s no secret that what you put in your body is an indicator of what you can get out of it. Whether you are prepping for a training exercise, developing a race day strategy or just making sure you’re eating the right way each day, there is a science behind your personal nutrition needs. The Bishop Racing coaching staff works individually with each athlete to ensure they understand how their bodies need to be fed so they can be at their best. With the help of our resident expert, Dr. Bob Murray, Bishop Racing is leveraging the latest advances in exercise nutrition and daily dietary intake to achieve better performance on and off the course. You need to understand how your body burns fuel and loses sweat/electrolytes to develop a custom approach to replenishing what you need. All It Takes Is One More Rep! One of the biggest oversights in athletics is how vital strength training is to improving your performance. Whether it’s increasing power and endurance, creating a stronger frame or focusing on injury prevention, strength training needs to be an integral part of any athlete’s training regimen. Head Assistant Coach & Certified Personal Trainer, Olivia May, spearheads Bishop Racing’s multi-layered approach to strength and conditioning. Our approach focuses on three different areas of fitness and incorporates a variety of different concepts that creates the total body athlete. Staying physically, mentally and emotionally healthy while balancing the demands of an active lifestyle can be challenging. You get tired. You get hurt. You need to be on the ball 24/7 to maintain all your priorities. Understanding what it takes to keep the mind fresh and the body sound, is where Bishop Racing separate itself from the rest. We believe It’s ok to take days off. It’s ok to pull back on the difficulty of a training session. Most importantly, injuries do happen. With the support of industry leading experts, Bishop Racing is able to guide our athletes on what to do when signs of fatigue and breakdown occur, and introduce the proper steps to recovery. No matter what bumps in the road you face along the journey, we are here to help you find your way back to a healthy, happy state of being. All we ask is that you commit to being the best you can be. The goal of improving your performance. The willingness to take your training to the next level. The desire to be part of a like-minded culture of serious, fun-loving athletes. What you’ll get in return is an athletic experience that exceeds expectations, workouts that test you to your core and an improvement in your abilities that you’ve only dreamt of.